This 13 Day Kenya & Tanzania safari tour commences at Nairobi in Kenya and travels through famous East Africa wildlife areas, finishing at Arusha in Tanzania. You will travel to Maasai Mara National Game Reserve, probably the most famous of the reserves in Kenya’s southwestern corner which boasts an astonishing amount of game, then onto Lake Nakuru National Park. You will then head south east to Amboseli National Park at the foot of the Mount Kilimanjaro, Africa’s greatest mountain. Heading further south you will cross the border into Tanzania and travel onto the Ngorongoro Conservation Area situated in the Great Rift Valley. It is an extinct volcano that collapsed in on itself around 25 million years ago thus forming a vast super bowl where the largest permanent concentration of African game is on display. From here you travel onto Serengeti National Park, the setting for the famous book and film, “Born Free”. The 14,763 square kilometres Serengeti National Park is famous for being the southern end of the Great Migration. Every year over 1.5 million animals, mostly wildebeest but also zebra and Thompson’s gazelle, follow their instincts and move through the western corridor on their 1000 kilometre journey to the fresh grazing areas of the Maasai Mara. Before traveling onto our final destination of Arusha, you spend one night at the Tarangire National Park which is famous for its dense wildlife population which is most spectacular between June and December. During this time of the year, thousands of animals migrate from dry savannah grasslands to Tarangire River looking for water. Price is valid until 15 December 2019. If travelling after this date please contact us for revised prices. Laundry (unless stated), Massage and Personal expenses such as telephone calls…etc. Breakfast followed by check out then depart Tarangire and drive back to Arusha. 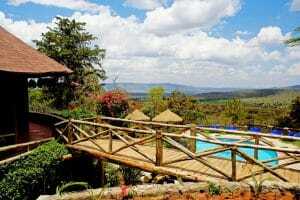 Arrive at the Mount Meru Hotel for lunch, then after lunch transfer to the Kilimanjaro airport for your outbound flight. – Breakfast & lunch. and private balconies. Room info: 54 twin/double rooms, 6 single rooms and 2 wheelchair rooms. Set in 200 acres of private land, and with a rustic charm all of its own, the lodge nestles in the foothills of Mount Kilimanjaro which, at almost six thousand metres, is Africa’s highest and most famous snow capped mountain. Standing high on the edge of a towering terracotta escarpment with panoramic views over the glittering alkaline waters of Lake Manyara, Lake Manyara Serena Safari Lodge offers a unique blend of safari opportunities, peace and tranquility, wildlife discovery, and ornithological richness. Grouped around a central ‘vanishing horizon’ pool, this highly unusual lodge features a simple timbered reception area, built in traditional African style. Perched on the very edge of the cliffs, with stunning views of Lake Manyara National Park is the pool bar and observation point. Built to blend in with the vastness of its surroundings, Tarangire Sopa Lodge lies hidden among the kopjes, ancient baobab and grasses of the Tarangire National Park. Cautionary note, because the lodge is not fenced in, wild animals are at liberty to come and go as they please therefore transits to your room and back might be delayed. This is the only reason our guards will insist on taking you to and from at night. Once inside the coolness of your room, you will be delighted at its space and airiness, and also the views from its sheltered veranda. With its mini-bar, 2 double beds and an extremely spacious bathroom. Room info: 75 rooms, 4 suitable for the physically challenged. 4 interleading rooms suitable for families.